Start the summer with a trim – Even if you’re growing your hair! Ask your hairdresser for a dusting (typically 1/8 of an inch) You won’t notice a difference in length, but your hair will look thicker an healthier. 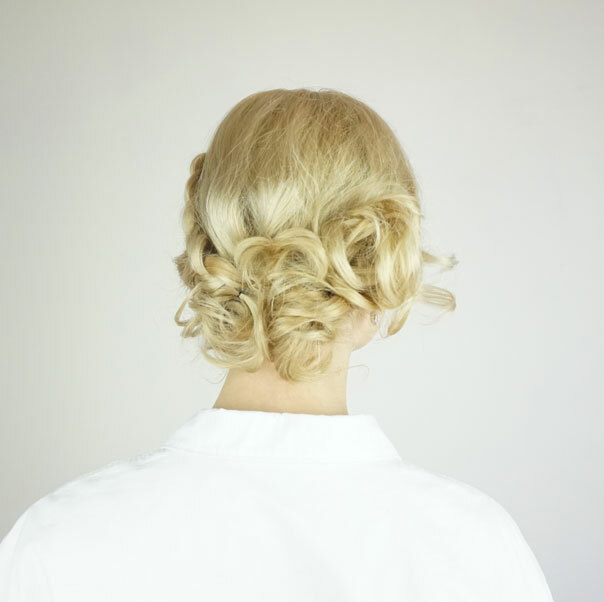 Drop the hot tools: Try heatless curling techniques. It can be as simple as braiding your hair into a loose braid. Once the hair dries and you take out the braid, you’ll have gorgeous waves and frizz free hair. If you absolutely have to use hot tools – Always use a heat protectant! Let your hair air dry as much as possible before you go in with a dryer. Scarves and hats are your friends – Scarves might take a bit of practice before you can tie them stylishly and cover your hair, but there is no reason you can’t stock up on hats for different occasions. They can be sporty,elegant or chic. They fit with any outfit, but most importantly they’ll help protect your hair from the sun! Invest in proper silicone and sulphate free shampoos and conditioners – Most store bought shampoos have silicone in them, which is a cheap option for many companies. It seals off your hair and coats it, leaving it smooth and frizz free for a while. The downside is that it builds up in your hair, weighing it down and making it flat and dull over time. Silicone doesn’t help rebuild the hair up and strengthen it from inside. By coating it, it prevents the conditioners and deep treatments you use to actually penetrate your hair. Use styling products with SPF 10-15 – UV protection is key for both your skin and hair. This one goes for all blondes, especially dyed blondes – Use a deep conditioning masque after EVERY wash. A general rule of thumb is to treat your hair like it’s damaged, using products designed for damaged hair. That goes even if it isn’t damaged! Trust me on this one, I speak from experience 😉 It will keep your blonde healthy and shiny. No matter what hair type or color – Always use products designed for your hair type. During summer, you might want to use deep conditioning treatments more often than normal. Especially if your hair is often exposed to the sun, salt water or chlorine. Whether for a party or a normal day, this hairstyle will definitely compliment a cute summer dress. If you don’t have naturally curly hair you will want to add curls. Once your hair is curly it will basically style itself. In light of what I wrote above, I suggest using a heatless overnight technique. 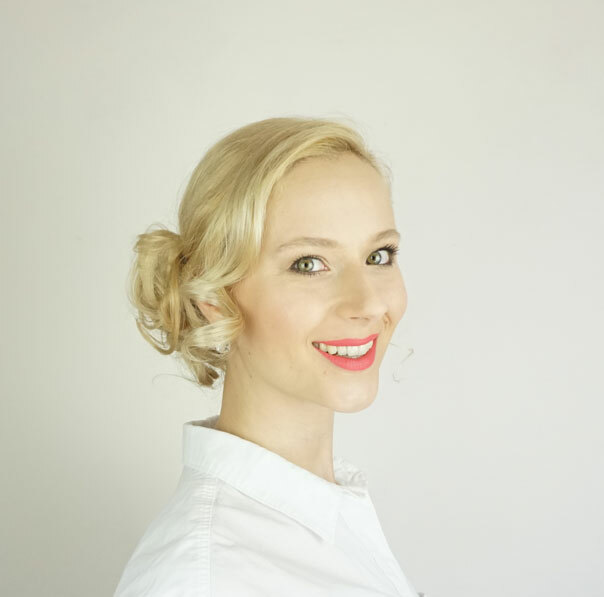 I used jumbo curlers because they are easy, fast and comfortable to sleep in. Pick up a chunk of hair on one side and divide into two strands. Now twist them loosely together. Once you reach the bottom, grab on to a couple of strands and push the rest of the hair up the hair shaft (picture 6). This will create a puffy, messy bun that you can now pin in place with a couple of bobby pins. Repeat step 2, two more times, placing all three buns close to each other. They should form a unified structure rather than three distinct buns. To create a lace braid on the other side, pick up a section of hair close to your part and divide it into three strands. Cross the outer strands over the middle starting with the front one. Every time you cross the front strand over, you’ll add in a new section to that strand and incorporate it into the braid. Only add in new hair from the front. After adding in the last section of hair from behind the ear into the braid, finish braiding it all the way down, pull gently on the edges of the braid to make it appear fuller and tie it off with an elastic. 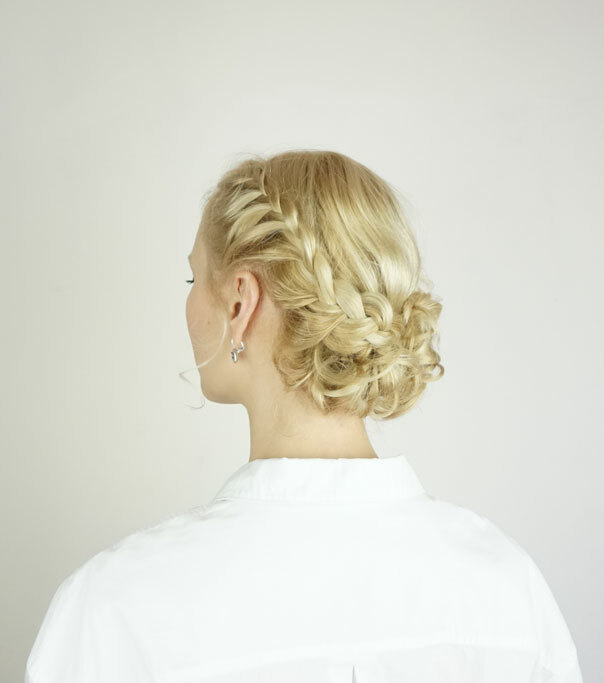 Drape the braid over and hide the end in between the buns, pin it in place with bobby pins. Now just pin in place whatever hair might have been left out of the braid and you’re done!